Elastomeric, elastic paint for the finishing of roofs and covering. It is a single-component, synthetic, viscous, white substance made with poly-acrylates. Once dried, it forms an extremely elastic and resistant finish, also against water, even if it is not indicated to remain in constant contact with the latter. IPAPLAST is particularly indicated as finish for roofs, where it can be used on any type of support, indistinctively. It can only be used in combination with IPA Primer and it is also suitable for holes of a certain size, prior introducing a stratified material. It can also be used as barrier against humidity in the insulation of humid environments and in particular in the construction of cold rooms, subject to strong stresses due to temperature changes. IPAPLAST is transparent, permeable to water vapour and, if laid at state-of-the-art, it boasts all the advantages of a liquid film. It is supplied in white colour, and in different colours upon request. It is non-flammable, odourless and non-toxic. Mix carefully prior to use, using an electric stirrer. Apply the product approximately 1 hour after the Primer, in 2-3 coats, with brush, spray or roll, also vertically. For optimal adherence, use IPA Primer. Apply the first of the two coats of thickness less than 1 mm on the surface where you applied the Primer (after about 1 hour at 20ºC). Apply the second coat only when the first coat is completely dry. The second coat must always have a thickness of at least 1 mm, and it must be applied with a roll. According to the characteristics of the support and specific needs, additional coats can be applied with the introduction of a laminate material starting from the second layer. Quartz can also be used starting from the second layer; the latter must be applied within the next 30 minutes from applying the layer of IPAPLAST. 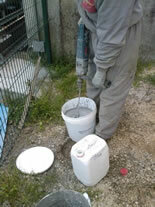 To fill holes, add maximum 10% of IPATIX in terms of weight, to the product. Clean the tools and equipment immediately after use with plenty of water prior to the hardening of the product.